Rated 5 out of 5 by janniemax from This is one of my favorite games to go back to When I want to re-play a Match 3 game, chances are this is the one I'll go to. Fun powerups, increasing difficulty without being impossible - and one of the few games that I'm willing to play with a time limit because it's not tight enough to make me crazy, just tight enough to make the final stages more challenging. Rated 5 out of 5 by betskand62 from Engrossing match 3 with nice art I like all the "Cradle of" games. This one is a fairly standard Match 3, but the "units" are particularly appealing visually, and the game can get fairly complicated as you get to higher levels. Meanwhile you earn supplies to build an Egyptian village with monuments, which are nice but not unusual. I've been through the game several times and find it relaxing, and the tourney and blitz modes are quite challenging. Rated 5 out of 5 by ret65 from A fun game and relaxing, a little!! Saw the reviews, love Cradle of Rome 2, so bought this. Very happy I believed the reviews. Great game, really nice graphics and a fun, fun, fun game to play. It has nice mini games to play which only add to this game. You will not be disappointed in this game. Lots of hours of pure fun when you don't watch tv. Recommend this highly. 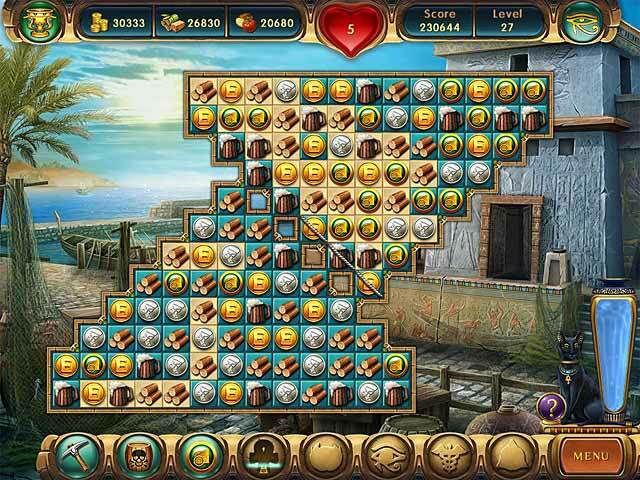 Rated 5 out of 5 by NirmalSitaldin from Cradle Of Egypt! :D Great match-3 game! Beautiful story, graphics, sounds. Very good game :D Love it! Rated 5 out of 5 by Gameritis50 from an excellent addition to your match 3 games Beautiful graphics, the music is pleasant, and very entertaining to play. Rated 5 out of 5 by TinkerOne from Another great "Cradle" I still go back to this game when I only have a short time to play - or just to pass the time and have fun. It is much better to me than Cradle of Persia. Great buy for today !! Rated 5 out of 5 by tailswhiskers from Fun Fun Fun This game is like Cradle of Rome except that you have to buy the blueprints to the buildings you want to buy. The rest is the same. The graphics are great. I would recommend this game. Rated 5 out of 5 by ahardwaytogo from A very good explorer game!!! One of the best!!!!!!!!!!!!!!!!!!!!! 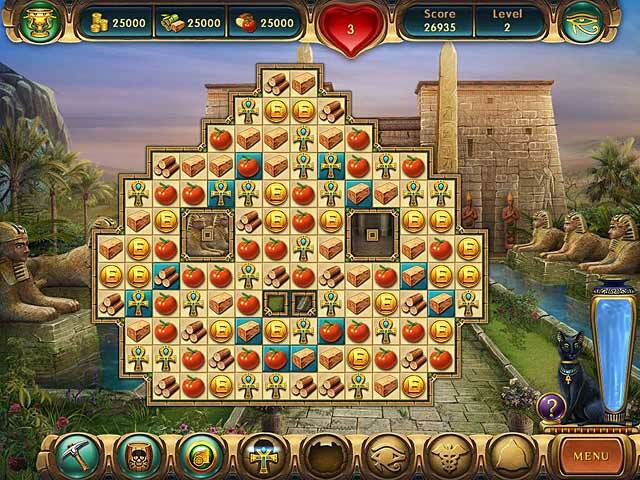 Rated 5 out of 5 by bayougal2323 from cradle of egypt love the game. when will it be available for ipad?????? Rated 5 out of 5 by cuorips from great game I am stuck on the 28 level on blitz for a month can't get passed it, but I will try until I die ! Rated 5 out of 5 by Kleshniak from Impressive Music I like cinematic soundtrack for this game. Hollywood sound in casual game! Great! Love it! Rated 5 out of 5 by Rebr2009 from One more addictive game! I love Match 3, and this is a quite good! Very well done, colorful, the level of difficulty increases at each phase. In addition to earning "weapons" (when you match axe, powder keg, etc, you fill them to use) to destroy pieces, rows...you have to collect food, supplies, coins, to build their city. Really enjoyable and provides hours and hours of fun. Rated 5 out of 5 by reidun70 from best game in a long time. i had try out a lot of mack 3 games, and theres a lot of boring games to choose from, but finally i found this great game! Rated 5 out of 5 by SRitchie from More than a match game Great fun and addicting!!! For anyone who's never played a match game, this would be the one to try. If you're already a fan of match games, you are going to love this one. 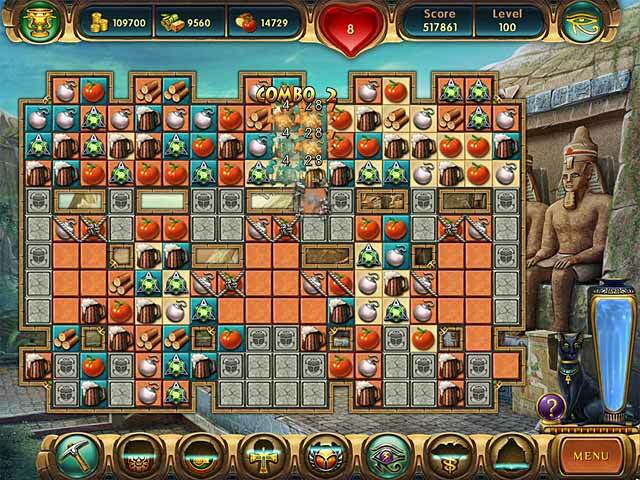 Rated 5 out of 5 by cumin65 from amazing match 3 game This is really a very addictive game, I really could not stop playing, level after level. Extremely fun and challenging! Rated 5 out of 5 by HondaTrike from Cradle of Egypt -- I really Like I'm burnt out on HOG games, though I do like strictly adventure games, but does not seem like any are coming out. All the HOG games are becoming the same, unlocking doors, chests, finding keys, etc etc. I finally switched to Match 3 games. I like games that you do not have to go against a timer -- relaxed. You can do that in this game. You do build the Egyptian type city, but it's fun. I don't like Sim games, but this does show the little characters building, but you earn, food, supplies, etc., through playing Match 3 levels. You are given items as you earn through the game like an ax to punch where you can have more items fall. I have really started liking Match 3 games, and this has been one of my favorites. I also liked Cave Quest. Just finished it before this one. 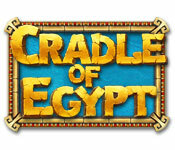 I went through all the forums and read about all the games before I decided on Cradle of Egypt. I believe I tried the Jewel Quest, Sapphire Dragon, but if I recall correctly it was a timed game, so I did not want to play it. If you like Match 3 games with a little interaction this game was fun. After this one I'm going to try to find another one like it. Also as with all the games, I turn the music down. I like sound effects but just a hint of music in the background. Rated 5 out of 5 by sens18 from Fun It is a great game to solve and build. Rated 5 out of 5 by kelvonn1 from Extremely fun Game keeps you challenged a good change of pace new puzzles just fun. Rated 5 out of 5 by Cluelass from Great Match 3 Game! This was one of those games that I just couldn't stop playing. The combination of the graphics, the journey, finding out about the different lands and the progressively challenging match 3 boards is a winning one! Rated 5 out of 5 by player1 from chain link poper Verywell done; Need to be an advanced macher to get through this game; hours of play time. Rated 5 out of 5 by tryingard from Late nights : I will finish at the next level. Lol. I usually play Adventure and IHOG games but thought I would try this Match 3, my first. From the moment I started playing I was hooked. I haven't finished it yet and I have had hours of play. I am playing in relaxed mode which is great because it gives me time to finish the level. It is also great to build and collect different items. I am looking forward to reaching the end which I am sure is not far away now. For an adventure nut I am enjoying this Match 3 for a change of thinking. Well done developers. Rated 5 out of 5 by Marly_55 from Love this game! The Cradle series of Match 3 games are addictive! The fact that you are not only playing a Match 3 game but building a city with your earnings from the levels makes for endless hours of game play. Great power ups to help you through the tough spots. Rated 5 out of 5 by Chamakku from Match 3 just couldn't get better!! Excellent game, loved it!! A must have for match 3 nuts like me!! Rated 5 out of 5 by undertaker54 from AWESOME I loved this game from the time I bought it! I recommend this game.